NEW YORK - On a stool at the Yankee Tavern, tucked under the subway tracks a block from Yankee Stadium, Steve LoPresti was the portrait of a lifelong Yankees fan. "You have two world championships," LoPresti lectured a visitor from Philadelphia. "It took you a hundred years to win the first. We only have 26." Baseball loyalties divided in N.E. Pa.
Are Phillies of today Phila. 's best team ever? See why Phillies fans love these guys? A chance for Philadelphia to put a beatdown on its northern big brother - on the city that thinks it stands at the center of the known universe, on the team that epitomizes arrogance, overspending and entitlement. "I hate that team. I hate 'em!" said Anthony Longo, who works at Harry Ochs Meats at the Reading Terminal Market. New York is Alex Rodriguez dating Kate Hudson, hounded by paparazzi. Philadelphia is Chase Utley marrying Jennifer Cooper, caring for hounds. New York is over-the-top George Steinbrenner. Philadelphia is under-the-radar David Montgomery. The Yankees have loads of history and tradition and championships. The Phillies have loads of history and tradition. "It seems like they have more of everything than we do," said Temple University assistant professor Emily Sparvero, who studies the business of sports. "They have the bigger media market. They have the new billion-dollar stadium. They have the stars in the stands." Given the cities' geographic proximity, "we're literally and figuratively in their shadow." Yankee fans are used to winning - and Philadelphia fans, starved for titles, resent them for their expectations. "If you had to pick one team to beat, it would be the Yankees," said Michael Bare, 28, a Center City information-technology specialist. "There's nothing better than beating the evil empire." Fans here loathe how the Yankees routinely outspend every other team in baseball, paying whatever it costs to sign the best players for another run at another title. This year the Yankees' payroll stood at $201 million. The Mets had the second-highest. The Phillies ranked seventh at $114 million, about $87 million less than the Yankees. Yet the Phillies and Yankees, as teams, encompass no distinct rivalry. The two play each other only rarely, in interleague games. Many New York sports fans care no more about Philadelphia than they do about, say, Cincinnati. At the New York Stadium Souvenir Shop, Marta Gonzalez laughed at the suggestion that, as a Yankees fan, she might harbor particular animus for Philadelphia or the Phillies. Really, how could she dislike a place that's so much smaller? "You're our neighbor," said Gonzalez, 60, trying to be nice. Which is part of the problem. To people in New York, Philadelphia is a city with one-third the economic power, one-sixth the population, and none of the cachet. Theirs is the city that people come from around the world to see. Philadelphia is the place where tourists hop off the bus for a while on their way to New York. "Everyone wants to beat the Yankees," acknowledged LoPresti, 59, dressed in a Yankees T-shirt and blue blazer at the Yankee Tavern. "Been that way since we bought the Bambino in the 1920s." Bartender John Quirk said he respected the Phillies, but their fans? "You make Red Sox fans look quiet," he said. Outside, near the stadium, 63-year-old Luis Perez steered his orange Schwinn across Babe Ruth Plaza, his ride trailing Yankees streamers and pennants. Perez laughed when asked for his World Series prediction, as if the answer should be obvious. "Yankees," he said. "They're the Yankees, the best team, the winning team." That's part of what infuriates Philadelphians - New York's assumption of primacy. How its residents seem to believe the accident of birth or economics that put them in New York also conferred on them an elevated status. That the phrase "I'm a New Yorker" somehow makes them different and better. The animosity can be traced back nearly 200 years, to the shifting fates of both cities and an era that saw Philadelphia surrender its role as the country's most important town. In the 1820s, Philadelphia was vibrant and prosperous, host to a spectrum of industries. The city produced fully 25 percent of the nation's steel, and Manayunk was known as "the Lowell of Pennsylvania" because it made so much cotton and wool. But the city had already lost its capital status, the state and federal governments having moved to Lancaster and Washington. New York surged ahead in population, making Philadelphia the country's second-largest city. The banking chiefs were leaving Chestnut Street, long the national center of finance, to resettle on a New York avenue called Wall Street. In her research, Temple's Sparvero found that cities tend to take on the character - the brand, so to speak - of their major industries. New York is the financial capital of the United States, and the Yankees, with their spend anything, buy anyone approach, embody that image. Which a lot of people don't like - spawning Web sites for Yankee haters such as one with this slogan: "Pricey new stadium. 'Roids. The same obnoxious fan base. What's not to hate?" The folks at www.bustedtees.com are selling T-shirts that feature a picture of Jesus and the phrase, "Jesus Hates the Yankees." Nobody is printing "Jesus hates the Phillies" shirts, because the team doesn't inspire that kind of contempt. Philadelphia has a much different image, the city and its baseball team more blue-collar and scrappy. The cheers of "Beat L.A!" had hardly faded before fans took up the cry of "Beat New York!" - and that was one of the milder chants. As thousands poured out of Citizens Bank Park on Wednesday, after the Phillies dismissed the Dodgers, they already were sure whom their team would face in the World Series.
" --- the Yankees!" one fan yelled. "Beautiful!" another called in response. It was fun to watch the Phillie Phanatic wield a grounds-crew tamping tool to smash Dodgers batting helmets. 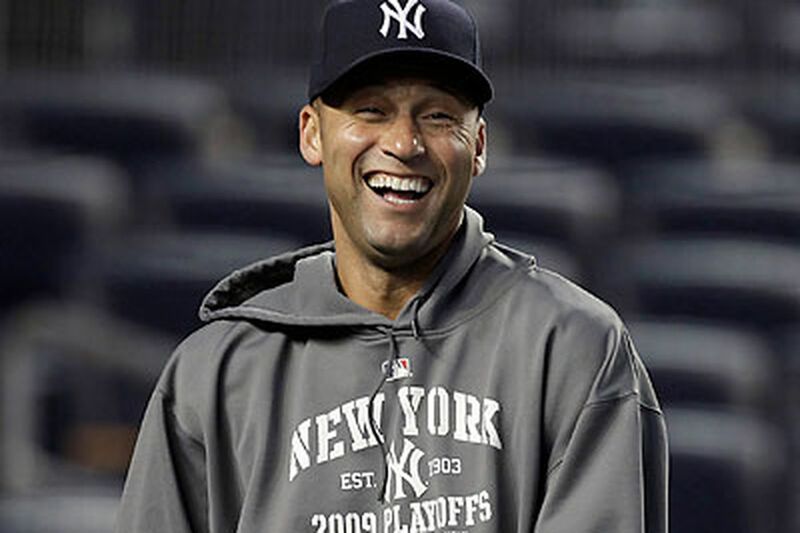 But the thought of him pulverizing Yankees gear was sublime. "This is our grudge match," said Gary Papouschek, a 46-year-old transplant coordinator at the Jefferson Kimmel Cancer Center. He wants revenge for the Yanks' 1950 World Series sweep of Philadelphia's Whiz Kids. Longo, the Reading Terminal Market worker, is rooting for the Phillies even though he's not a big fan. He roots first for the Mets, second for the Phillies, and third for whoever is playing the Yankees. "The Phillies, that team's got magic," he said. "They got a confidence that's not arrogance. The Yankees confidence is arrogance. I can't stand that." Bob Cole knows the feeling. Outside of Bob & Ron's World Wide Stereo in Montgomeryville stands a huge sign that says, "Phillies fans turn left" - into the store's parking lot, and - "Yankees fans may turn right." It's Cole's way of showing his allegiance to the Phils, and casting his store as the home team in a battle against its across-the-street, out-of-state competitor, Sixth Avenue Electronics. "We're rabid Phillies fans here," Cole said. "We're fighting this huge New York-North Jersey firm." New Jersey endures its own baseball schizophrenia, split between people in the south who adore the Phillies, and those in the north who root for the Mets or Yankees. The only thing that unites North Jersey and South Jersey is Bruce Springsteen. And he's not scheduled to perform at Yankee Stadium. The Yankees are booked, though, starting tomorrow. "They're a dynasty-type team," said Arun Singh, a medical student at Thomas Jefferson University. "It's time for the Phillies to make a name for themselves. Not just last year, not just this year, but in history." Contact staff writer Jeff Gammage at 215-854-2415 or jgammage@phillynews.com. Inquirer staff writer Matthew Spolar contributed to this story.